Some auto body shops worried about having installed Takata airbags can sleep a little easier based on some responses from vehicle manufacturers to an Society of Collision Repair Specialists. American and Canadian collision repair markets are already oversaturated, and new advances in vehicle technology and materials will force some shops out of business, a Mitchell expert predicted in a recent Q&A. Another highlight: He says there’s only one set of repair estimating books for insurers and repairers. An Ohio body shop network and State Farm have settled a 140-claim lawsuit over State Farm’s handling of total loss bills. Allstate said Wednesday that its auto insurance business declined in profitability in the last three months of 2014, but overall did about the same in 2014 as 2013. However, subsidiaries Encompass and Esurance lost money again — which could have ramifications for the collision repair business in terms of claims pressure. 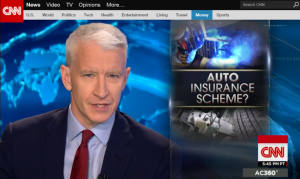 An “Anderson Cooper 360″ piece Wednesday night criticized insurers for mandating salvage or aftermarket parts and “steering” customers to corner-cutting body shops.